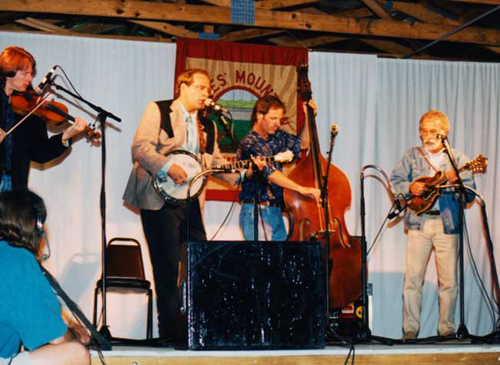 1990 saw the Nashville Bluegrass Band crisscrossing the U.S. Sometimes by air, sometimes in their motor home, they toured from Boston to Little Rock, Texas to Wisconsin to Oregon. They traveled north to the big Mariposa Folk Festival in Canada. And they got their first look at Europe. 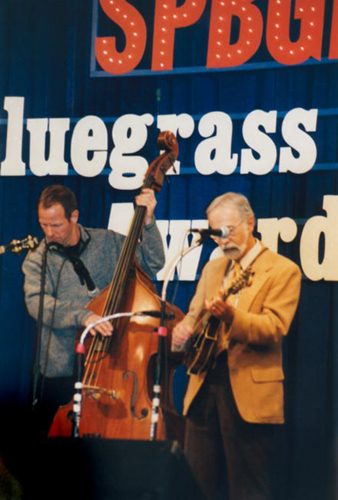 This was the first year the Nashville Bluegrass Band would be invited to play on the Grand Ole Opry, a career benchmark for acoustic music performers. The Renfro Valley Barn Dance in Kentucky and Opryland in Nashville would enjoy NBB performances during the year and the band would play at the Lincoln Center in New York City. This was also the summer they would meet the legendary Fairfield Four. “We got interested in doing black gospel music through Bruce Nemerov. We first met The Fairfield Four at Grass Roots Days in Centennial Park in Nashville in the summer of 1990. Keith Case had started to represent them. We were asked to perform for a party at BMI later on that year and were thrilled to find ourselves on the same bill with them,” Alan recalled.“ Both groups would also appear at IBMA's annual convention that fall. “At the big awards show, we did a tune with The Fairfield Four. It was a time we will never forget. It stands out in our minds as one of the greatest moments we've ever enjoyed as a band.” Later that year, the two groups would join up again for performances in Dayton, Ohio, and Ann Arbor, Michigan. The Boys Are Back in Town was nominated for a Grammy Award, NARAS' first year to open the Bluegrass Album category; in fact, every album the group releases from this point will be among the nominees. By 1991, NBB was in the studio often. They recorded a project with Peter Rowan in February, and recorded Home Of The Blues, featuring The Fairfield Four and Jerry Douglas later that year. Jerry produced the album which featured great songs from The Delmore Brothers, Jimmie Rodgers, Bill Monroe, and Johnny Cash. “We had started using a mailing list about that time and had a huge Station Inn following. We played the Station Inn about once a month. There were clubs like it all over the country, such as the Bottom Line in New York City, and Freight & Salvage in Berkeley,” recalls Alan. Nashville Bluegrass Band played them all. They gave live radio performances and played at festivals everywhere. Ben & Jerry’s Newport Folk Festival, Winterhawk, and Swannanoa where NBB shared the bill with Don Humphries. They checked in at Bean Blossom, and performed in the Fairfield Four Tribute Show at Nashville's Summer Lights Festival. They played Stinking Creek, Tennessee, the Cactus Cafe in Austin, Texas, and appeared on Nashville Gospel with Jack Hurst. 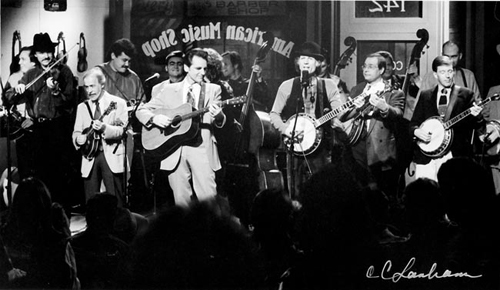 As if to cement their place in the landscape of American music, the Nashville Bluegrass Band joined the Fairfield Four in a sold-out concert at Carnegie Hall in April 1991. NBB traveled to Hollywood in October to tape a music video for Dave Allen's song Blue Train. When the clip was was mastered, it found immediate rotation on CMT, which at the time played only music videos. 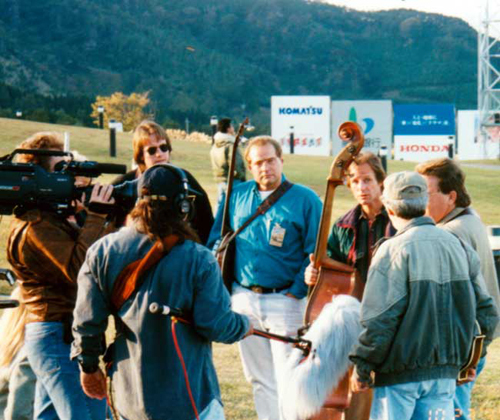 Ralph Emery invited NBB to perform on the cable hit Nashville Now twice during the year, including a fun romp with Marty Stuart. In November, it was back to Germany for an 18-day tour. In January, NBB was invited to appear on the American Music Shop, a Nashville Network variety show taped at the Cannery in Nashville. It would be the first of many appearances on the show. NBB also made their first of many visits to TNN's Crook & Chase show. One of NBB's highest honors that year came when they were asked to take part in the Grand Ole Opry's Birthday Party. They also were invited to perform at the Country Music Foundation’s 25th Anniversary Special alongside Ricky Skaggs, Alison Krauss, the Chieftains, and Jerry Douglas. Riding a wave of interest from the country music industry, NBB appeared for the first time at CMA's Fan Fair, a tradition they would follow for many years to come. 1992 was NBB's first year to play Telluride, high in the Colorado Rockies. They played the Old Joe Clark Festival in Mr. Vernon, Kentucky. They returned to Winterhawk and Bean Blossom, and found their way to the Newport Folk Festival. A second visit to the Grand Ole Opry came their way. They played Wolftrap, Virginia, as a part of Ricky Skagg’s Pickin’ Party (which the group would do again a year later in San Francisco), and shared the bill again with Skaggs in Branson, Missouri. NBB also performed at the Old Town School of Music in Chicago and at Johnny D’s in Boston. Touring picked up. Pasadena, Columbus, Cincinnati, Wichita, Tuscaloosa. Pennsylvania, Arizona, New York. They remember driving into Oklahoma just after the monster tornado hit. In 1993, the boys made an appearance again on the American Music Shop. They also performed with the Fairfield Four on Nashville Now. The group played on Hairl Hensley’s radio program, returned to Crook & Chase, and entertained at SPBGMA. This year they appeared at a benefit for Red Allen, the Jim & Jessie Bluegrass Festival, and returned to Bean Blossom, SPBGMA and Fan Fest. NBB visited the Strawberry Festival in Yosemite, the Renfro Valley Barn Dance, the Edmonton Folk Festival, Bean Blossom and MerleFest. Lexington, Branson, Bass Mountain, and Washington DC. 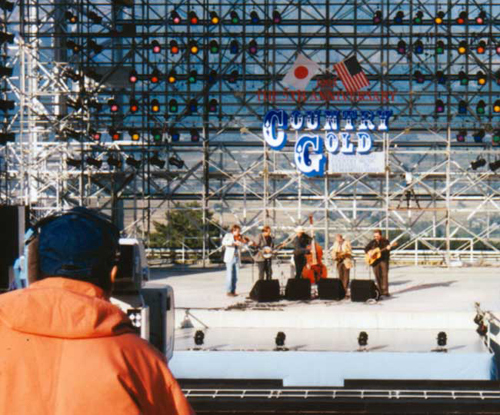 In October, the group returned again to Japan for their third visit, this time with the Country Gold tour there. NBB had been nominated for a Grammy in 1991. 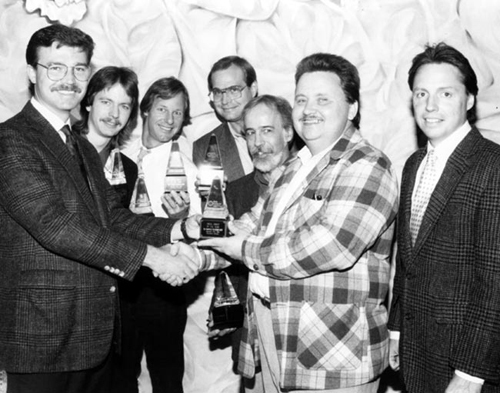 All five went out to Los Angeles and attended the show that year only to watch another artist walk away with the prize. When they were nominated for 1993's Waitin' For The Hard Times To Go, the boys weren't particularly optimistic. The group dispatched Roland to the Grammy Awards while the rest watched the ceremony on the television at a friend’s house. "We just couldn't believe it. We never thought we’d win," Alan O'Bryant remembers. Roland was astonished as he graciously accepted NBB's first Grammy Award. The band made their first of many appearances on the popular Prairie Home Companion radio show. "They would put us up in the five-star St.Paul Hotel. It's like a palace. We always liked to take the wives when we played there. We loved everything about playing that show," recalls O'Bryant. "We also started doing Community Concert Tours in 1994. This type of performance dates way back to the the Depression. The National Community Concert Association would sponsor acts to spread culture to small towns across the US," Alan continued. "We'd play local schools, churches and small community theaters. We participated in the program for three years, even did two tours in one year. It was a lot fun to do." NBB's first tour went to small towns in the Midwest, the MidSouth and New England. 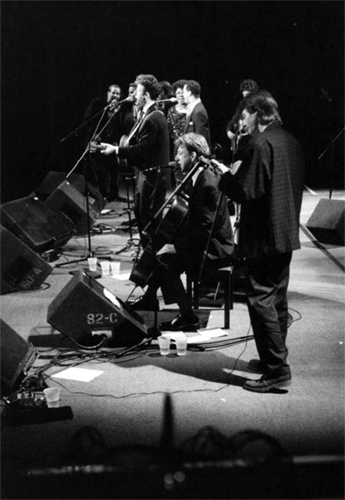 NBB was the first bluegrass band to do this type of tour. 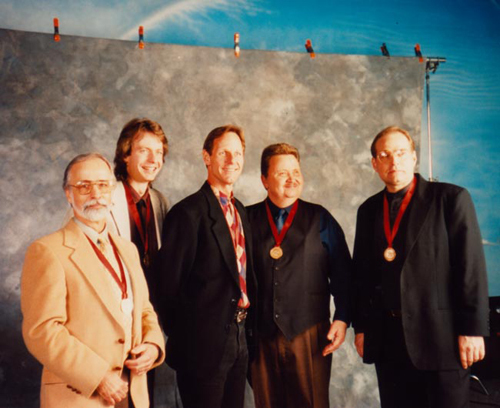 The Nashville Bluegrass Band again traveled abroad in 1994, this time to Rome, Italy. They also played in Cedar Rapids, Reno, Santa Fe, Huntsville, Fort Wayne, Raleigh, Kalamazoo, Tacoma, St. Louis, Chicago and many cities in between. NBB joined Clint Black for two tunes on his Christmas album Looking For Christmas and later appeared on the Clint Black Christmas Special. USO Country Christmas, a tour which became popular in 1993 and 1994, sent country music singers Rick Orozco and the Forester Sisters to boost troop morale; in 1995, the Nashville Bluegrass Band joined the roster. "We took Missy Raines with us on bass that time, and performed on military bases in Spain, the Azores, Turkey, the Isle of Crete, and Italy." NBB was on the short list when it came to who should be on the bill the first season of Bluegrass Night at the Ryman. This year they participated in the Community Concert Series and the Disney Institute for the first of two years. They played Prairie Home Companion in St. Paul as they would the next year in New York City, and Ricky Skaggs Pickin' Party at Wolftrap in DC . There boys proved to remain a favorite at Winterhawk, Telluride, Grass Valley, MerleFest and the Grand Ole Opry, and in hometowns all across the US. • NBB joined Johnny Cash on a tune for Dead Man Walking: Songs From and Inspired By The Soundtrack. NBB had the honor of performing at the Smithsonian Institute in Washington, DC. 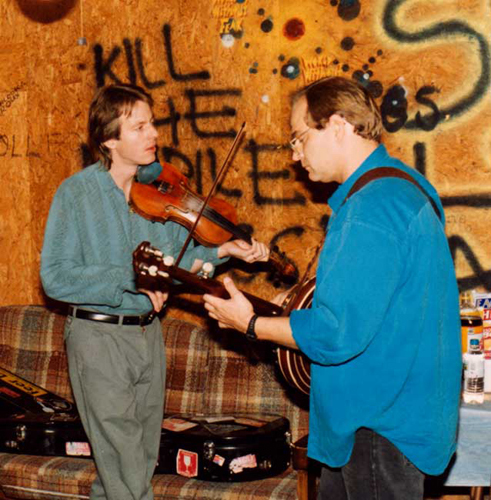 In a totally acoustic gig, the group played in a room designed before electronic enhancement. "Awesome, unbelievably clear sound. No microphone necessary," recalls Alan. The demand for NBB performances came from every direction. This year, they played Wynonna Judd's memorable wedding reception, a benefit for the late Courtney Johnson, and a concert at Belmont College. They played Ricky Skagg's Pickin' Party in Dover, Ohio. But it was in Minnesota that they shared the limelight with the most unusual headliner. "When you're in this business you get to see just about everything," said Alan O'Bryant. "Well, we played the Minnesota State Fair that year. It was held in this little frontier village, with an old school house and all these little old shops and barns and stuff. What was unusual was that we were rotating sets with this guy selling bass lures. He had a huge glass tank full of fish sitting on a truck bed. And he would set about catching the fish in this tank. It really was amazing; he could catch one in seconds after he tossed that lure in there. His crowds were so much bigger than ours," O'Bryant laughs. This year NBB hit Wheeling, Durham, Knoxville, Salt Lake City, Duluth, Seattle, Baltimore, Albany, the Berkshires and many points in between. They returned to Merlefest and The Strawberry Festival in Yosemite, performed at IBMA Fan Fest, and played a second year at the Disney Institute in Orlando. Good thing they came home. Gibson gave O'Bryant a custom Style 5 banjo built specifically to his specs. 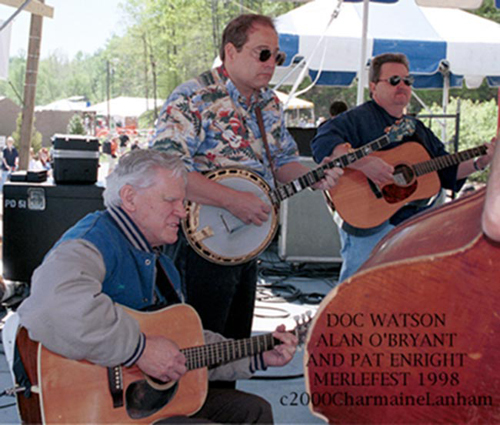 Walter Carter and Todd Wright (now with Deering Banjos) helped orchestrate the deal and Alan still plays it in every show. NBB performed that year in Charleston, Minneapolis, Horsepins, Albany and Gettysburg among others. 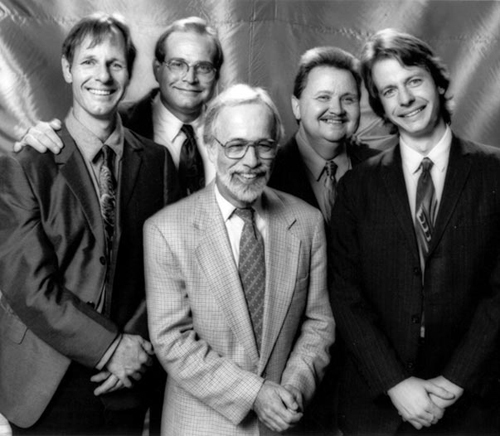 They toured extensively in the Northeastern US, and appeared on the Prairie Home Companion again. • Recorded American Beauty, produced by NBB & Mark Howard, received a Grammy nomination. Featured songs from Flatt & Scruggs, Bob Dylan, Ralph Stanley, Kate Campbell. By 1998, the tours were getting longer and more demanding. NBB traveled coast to coast -- Bolder, Durango, Annapolis, Louisville, Redondo Beach and Brunswick, Maine. They put in appearances at MerleFest, Telluride, Grass Valley, and the Southern Folklife Festival. They visited 14 cities for the National Community Concert Association including Yakima, Washington, Glendale and Ontario, California, and Craig, Colorado. The Paramount in Bristol, Tennessee, and Cafe Milano also enjoyed NBB performances that year. 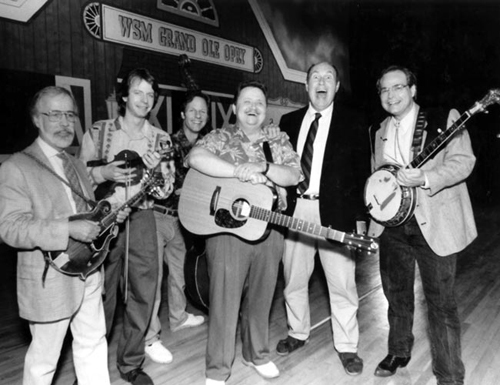 The Nashville Bluegrass Band was seen on Crook & Chase, the Grand Ole Opry, Prairie Home Companion, and Hairl Hensley's Bluegrass Show. They visited Ireland for the first time, and made appearances at Winterhawk, Bean Blossom, MerleFest, SPBGMA, the Station Inn and the Jim and Jesse McReynolds Benefit. 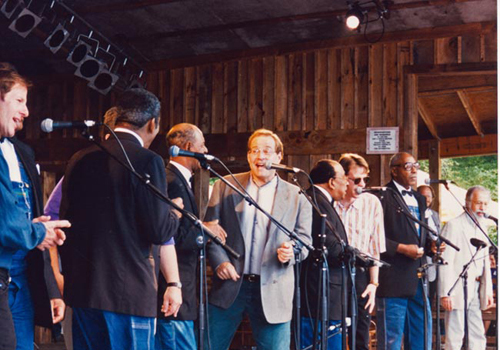 Their 1999 Community Concert Tour took the boys south to Lafayette and New Iberia, Louisiana; Bolger, Del Rio, Corpus Christy and Dallas, Texas; and Selma, Alabama. They were headed into Bartlettsville, Oklahoma, when they nearly came face to face with the historic Force 5 tornado that swept into Oklahoma City that day. This year NBB sold out the Barns at Wolftrap in Vienna, Virginia, and played at the Opry House in Woodstock, Illinois, where the movie Groundhog Day was shot. NBB also traveled to Akron, Austin and St. Paul, among other towns. In the fall of the year, Roland White announced that he'd like to slow down some and promote some other projects he had on the table. "I'm in my early sixties now and there's some things I've always wanted to do, " he told the group. "I don't want to miss my opportunity to do them." Roland stayed with the band, on the best of terms, through the end of 1999 and still performs with NBB from time to time. "From the moment I heard that Roland wanted to leave, I knew who I was going to call," Alan O'Bryant said regarding the mandolin slot. Compton happily accepted the invitation to rejoin the band, effective January 2000. It gave a new meaning to the millenium.